The intention of this change is to (1)allow the students to select the questions that they want, (2) that are most relevant to their experience (3) and that are reflective of their individual circumstances. There will be not be any questions that are considered any more or less important than others and they will all be given equal consideration in the application process. We have attached a document containing the eight questions that students will select from. There is also a worksheet that will assist students in helping to brainstorm ideas for each of the questions which we will discuss and distribute to parents during their family meetings to be held beginning the week of April 11, 2016. During the summer, it would be a great exercise for students to begin formulating the answers to these essay prompts so that they can get a ‘headstart’ on their college applications for senior year. While these essay prompts are specifically for the UC applications, many of these are similar to other essays that are included on the Common Application and other college applications. Therefore, if students have completed these essays, they may be able to ‘repurpose’ them and use them for other college applications. 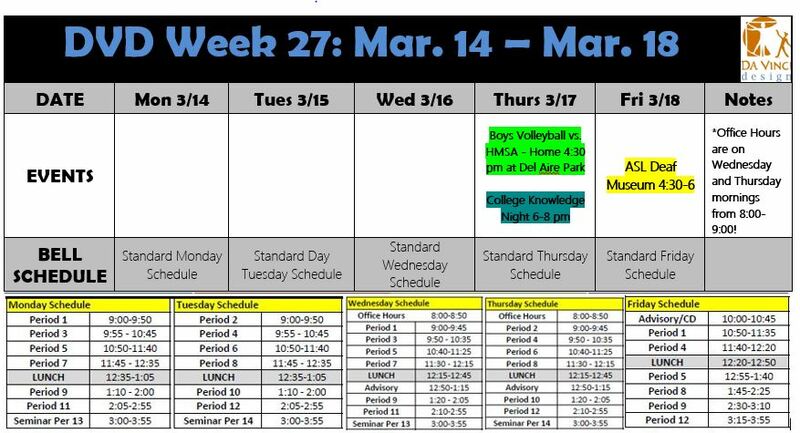 Last Day Before Spring Break, Leadership Applications Due, Attendance Matters! Designers, we have one more day before spring break! Please note that tomorrow, Friday 3/25, is the deadline for Leadership applications! You can turn in your completed application to the Principal’s office. As mentioned in our previous post – each day of attendance matters. There are many things happening on campus tomorrow – we should see every student here! Teachers have planned a variety of activities. You might be taking a test or final or doing an outdoor physics experiment. You may also be doing a scavenger hunt, touching up murals or getting a head start on your next project. See you all tomorrow! There is still time to register and pay for the upcoming Princeton Review ACT prep classes to be held at Da Vinci Design. 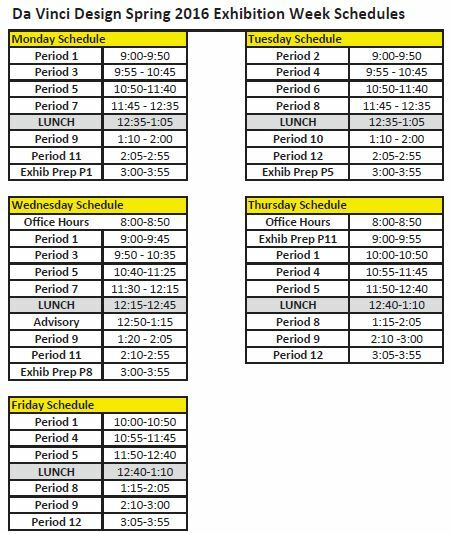 The classes will be held on the Design campus on Tuesday and Thursdays after school and also includes three practice tests as well as three hours of one-to-one personalized instruction online. The reduced price for Da Vinci students is $299 (versus the regular price of $699). If you prefer, this can be broken down into three payments ($100, $100, $99) as long as the total amount is paid by Thursday, May 12, 2016. These classes will prepare the student(s) who will be taking the June 11 , 2016 ACT with writing exam. (Last date to register for this exam is May 6, 2016). A flyer with key information is attached! Da Vinci Design families – a huge thank you for your attendance last night at our Exhibition. The campus was filled with such positive energy and support from you all and we are so grateful to have such wonderful and involved families! Da Vinci Design students and staff – thank you for your incredible dedication and hard work leading up to Exhibition Night. It was yet another display of the amazing work you do here, day in and and day out. Special thanks to Toby Harwell and all of our performers who rocked it last night, as well as Earlez Grille, who was serving up food for visitors until the very end! Families and students – the day or two after Exhibition, we have historically had lower attendance rates for students than is normal for Da Vinci. Every day of attendance matters! Teachers have been working hard to ensure there are meaningful and relevant activities going on over the course of the next two days before spring break. Please make sure your child is attending school today and tomorrow and call the school with any questions for concerns. Need something to do over the summer that will also benefit your future? Look no further! 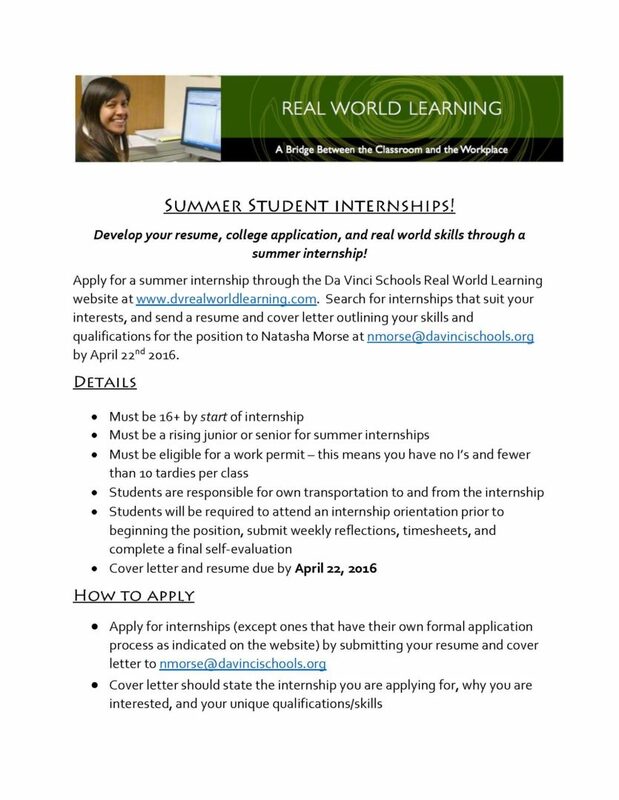 Apply for a summer internship now! Deadline for applications is April 22, 2016. Contact Natasha Morse (nmorse@davincischools.org) with any questions. and is sponsored by the Riordan Programs. There will be various games, competitions,food and prizes. Students were notified of this trip at their last meeting. We have provided the students with permission slips. These permission slips need to be completed and signed and the students should bring them with them on the bus on the day of the trip. Here is the list of students who are in the Riordan SBI Program and expected to attend the event. Hello Designers! We look forward to seeing you this evening at Exhibition from 6-8 pm. There will be food served by Earlez Grille, live music at the back of campus, and of course many of the amazing projects and presentations that students have worked so hard to complete. The project descriptions and room locations for DVD are below. We will see everyone soon! 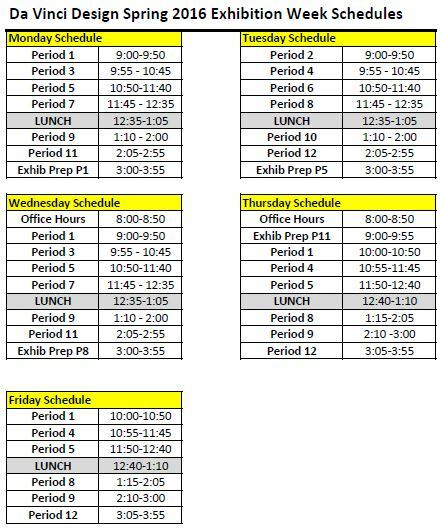 Designers – below are the most updated bell schedules for this week. We look forward to seeing you at Exhibition on Wednesday night at 6 pm! Recently a few of you asked how the Annual Giving donations are used at DVD. Thank you for asking! We use your Annual Giving dollars to do so many things! You have probably noticed that we have a dedicated Fab Lab stocked with many great art and design supplies. Your dollars also support our real-world, project-based curriculum, college visits, technology, and a classroom materials budget for every teacher. There is a $500 per student gap between state dollars and what we need to operate the high quality program that we provide. Your donations ensure that programs like Early College, Work Experience, and teacher budgets are all possible. Week 28 Update – Exhibition Week! Designers – Exhibition Week is here! We look forward to seeing all of the families and community members on Wednesday night from 6-8 pm. Please be mindful of the residents in the neighborhood when parking and driving that evening! 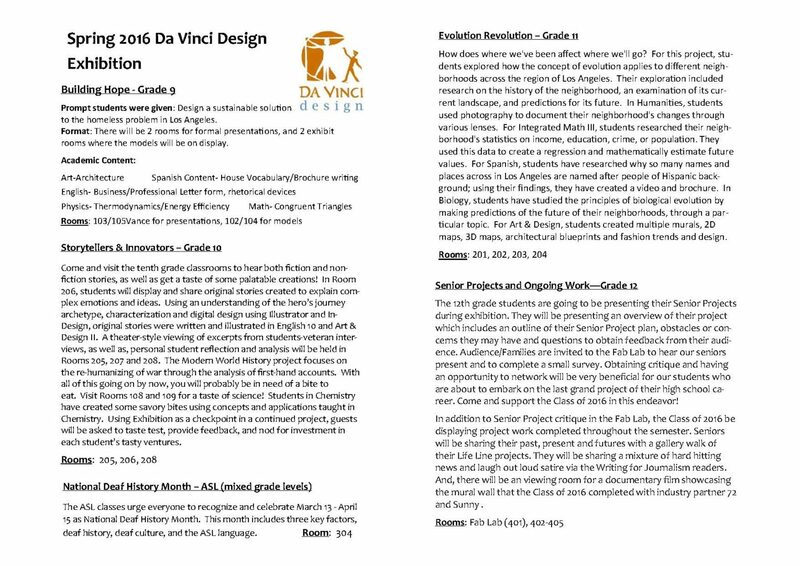 Da Vinci Design Summer Camp Applications are now available for this summer! Accepting applicants entering 1st through 6th grade. The camp is run by Da Vinci Design teachers and students. Spread the word! Time is running out to double your donation! Thanks to a generous matching challenge by Chevron, Belkin, Northrop and Kinecta, every donation and pledge made to the Annual Giving Campaign by March 31 will be DOUBLED, up to $50,000. We are so grateful to those families who have already donated, yet our Da Vinci Design giving participation stands at only 12% to date. We are seeking 100% family participation. Your contribution provides immediate support to Da Vinci’s top priorities. This year we have a $500 per student gap between what the state provides and what it really costs to deliver an outstanding Da Vinci education. Every gift matters! Make a tax-deductible gift or pledge today by using this link. Designers, check out your Week 27 update for upcoming events. Don’t miss College Knowledge Night this Thursday 3/17, the ASL Museum on Friday, and Exhibition next week on Wednesday 3/23! We look forward to seeing you all there. Time: 6:00-8:00 pm (choice of four 25 minute rotating workshops) – Come when you can and take one, two or four workshops!